Nearly all the bundles in an OSGi framework must deal with events, either as an event publisher or as an event handler. So far, the preferred mechanism to disperse those events have been the service interface mechanism. Dispatching events for a design related to X, usually involves a service of type XListener. However, this model does not scale well for fine grained events that must be dispatched to many different handlers. Additionally, the dynamic nature of the OSGi environment introduces several complexities because both event publishers and event handlers can appear and disappear at any time. The Event Admin service provides an inter-bundle communication mechanism. It is based on a event publish and subscribe model, popular in many message based systems. This specification defines the details for the participants in this event model. Simplifications - The model must significantly simplify the process of programming an event source and an event handler. Dependencies - Handle the myriad of dependencies between event sources and event handlers for proper cleanup. Synchronicity - It must be possible to deliver events asynchronously or synchronously with the caller. Event Window - Only event handlers that are active when an event is published must receive this event, handlers that register later must not see the event. Performance - The event mechanism must impose minimal overhead in delivering events. Reliability - The Event Admin must ensure that events continue to be delivered regardless the quality of the event handlers. Security - Publishing and receiving events are sensitive operations that must be protected per event type. Extensibility - It must be possible to define new event types with their own data types. Native Code - Events must be able to be passed to native code or come from native code. OSGi Events - The OSGi Framework, as well as a number of OSGi services, already have number of its own events defined. For uniformity of processing, these have to be mapped into generic event types. Event - An Event object has a topic and a Dictionary object that contains the event properties. It is an immutable object. Event Admin - The service that provides the publish and subscribe model to Event Handlers and Event Publishers. Event Handler - A service that receives and handles Event objects. Event Publisher - A bundle that sends event through the Event Admin service. Event Subscriber - Another name for an Event Handler. Topic - The name of an Event type. Event Properties - The set of properties that is associated with an Event. The Event Admin service provides a place for bundles to publish events, regardless of their destination. It is also used by Event Handlers to subscribe to specific types of events. Events are published under a topic, together with a number of event properties. Event Handlers can specify a filter to control the Events they receive on a very fine grained basis. Architects - The Event Admin Architecture provides an overview of the Event Admin service. Event Publishers - The Event Publisher provides an introduction of how to write an Event Publisher. The Event Admin Architecture provides a good overview of the design. Event Subscribers/Handlers - The Event Handler provides the rules on how to subscribe and handle events. The Event Admin is based on the Publish-Subscribe pattern. This pattern decouples sources from their handlers by interposing an event channel between them. The publisher posts events to the channel, which identifies which handlers need to be notified and then takes care of the notification process. This model is depicted in Figure 113.2. 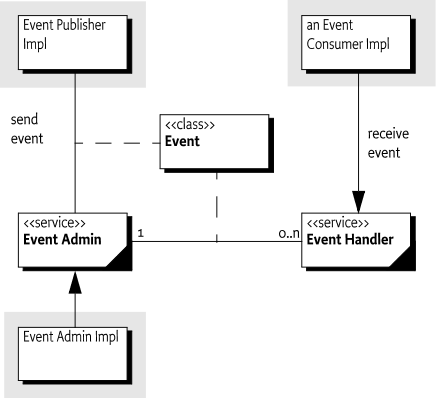 In this model, the event source and event handler are completely decoupled because neither has any direct knowledge of the other. The complicated logic of monitoring changes in the event publishers and event handlers is completely contained within the event channel. This is highly advantageous in an OSGi environment because it simplifies the process of both sending and receiving events. Topic - A topic that defines what happened. For example, when a bundle is started an event is published that has a topic of org/osgi/framework/BundleEvent/STARTED. Properties - Zero or more properties that contain additional information about the event. For example, the previous example event has a property of bundle.id which is set to a Long object, among other properties. The topic of an event defines the type of the event. It is fairly granular in order to give handlers the opportunity to register for just the events they are interested in. When a topic is designed, its name should not include any other information, such as the publisher of the event or the data associated with the event, those parts are intended to be stored in the event properties. The topic is intended to serve as a first-level filter for determining which handlers should receive the event. Event Admin service implementations use the structure of the topic to optimize the dispatching of the events to the handlers. Topics should be designed to become more specific when going from left to right. Handlers can provide a prefix that matches a topic, using the preferred order allows a handler to minimize the number of prefixes it needs to register. Topics are case-sensitive. As a convention, topics should follow the reverse domain name scheme used by Java packages to guarantee uniqueness. The separator must be a solidus ('/' \u002F) instead of the full stop ('.' \u002E). This specification uses the convention fully/qualified/package/ClassName/ACTION. If necessary, a pseudo-class-name is used. Information about the actual event is provided as properties. The property name is a case-sensitive string and the value can be any object. Although any Java object can be used as a property value, only String objects and the eight primitive types (plus their wrappers) should be used. Other types cannot be passed to handlers that reside external from the Java VM. Another reason that arbitrary classes should not be used is the mutability of objects. If the values are not immutable, then any handler that receives the event could change the value. Any handlers that received the event subsequently would see the altered value and not the value as it was when the event was sent. The topic of the event is available as a property with the key EVENT_TOPIC. This allows filters to include the topic as a condition if necessary. An event processing system can become a bottleneck in large systems. One expensive aspect of the Event object is its properties and its immutability. This combination requires the Event object to create a copy of the properties for each object. There are many situations where the same properties are dispatched through Event Admin, the topic is then used to signal the information. Creating the copy of the properties can therefore take unnecessary CPU time and memory. However, the immutability of the Event object requires the properties to be immutable. For this reason, this specification also provides an immutable Map with the Event Properties class. This class implements an immutable map that is recognized and trusted by the Event object to not mutate. Using an Event Properties object allows a client to create many different Event objects with different topics but sharing the same properties object. The following example shows how an event poster can limit the copying of the properties. Event handlers must be registered as services with the OSGi framework under the object class org.osgi.service.event.EventHandler. Event handlers should be registered with a property (constant from the EventConstants class) EVENT_TOPIC. The value being a String, String or Collection<String> object that describes which topics the handler is interested in. A wildcard asterisk ('*' \u002A) may be used as the last token of a topic name, for example com/action/*. This matches any topic that shares the same first tokens. For example, com/action/* matches com/action/listen. Event Handlers which have not specified the EVENT_TOPIC service property must not receive events. The EventTopics component property type can be used for this property on Declarative Services components. Event handlers can also be registered with a service property named EVENT_FILTER. The value of this property must be a string containing a Framework filter specification. Any of the event's properties can be used in the filter expression. Each Event Handler is notified for any event which belongs to the topics the handler has expressed an interest in. If the handler has defined a EVENT_FILTER service property then the event properties must also match the filter expression. If the filter is an error, then the Event Admin service should log a warning and further ignore the Event Handler. The EventFilter component property type can be used for this property on Declarative Services components. For example, a bundle wants to see all Log Service events with a level of WARNING or ERROR, but it must ignore the INFO and DEBUG events. Additionally, the only events of interest are when the bundle symbolic name starts with com.acme. If there are multiple Event Admin services registered with the Framework then all Event Admin services must send their published events to all registered Event Handlers. Not set or set to both - The Event Admin must deliver the events in the proper order. DELIVERY_ASYNC_ORDERED - Events must be delivered in order. DELIVERY_ASYNC_UNORDERED - Allow the events to be delivered in any order. The EventDelivery component property type can be used for this property on Declarative Services components. To fire an event, the event source must retrieve the Event Admin service from the OSGi service registry. Then it creates the event object and calls one of the Event Admin service's methods to fire the event either synchronously or asynchronously. The following example is a class that publishes a time event every 60 seconds. Some handlers are more interested in the contents of an event rather than what actually happened. For example, a handler wants to be notified whenever an Exception is thrown anywhere in the system. Both Framework Events and Log Entry events may contain an exception that would be of interest to this hypothetical handler. If both Framework Events and Log Entries use the same property names then the handler can access the Exception in exactly the same way. If some future event type follows the same conventions then the handler can receive and process the new event type even though it had no knowledge of it when it was compiled. A list of these property names can be found in the following table. Must be equal to exception.getMessage(). A service's persistent identity. A PID that is specified with a String must be coerced into a Collection<String>. If a type code for the event is unknown then the event must be ignored. In order to present a consistent view of all the events occurring in the system, the existing Framework-level events are mapped to the Event Admin's publish-subscribe model. This allows event subscribers to treat framework events exactly the same as other events. It is the responsibility of the Event Admin service implementation to map these Framework events to its queue. The properties associated with the event depends on its class as outlined in the following sections. Other events are ignored, no event will be send by the Event Admin. The following event properties must be set for a Framework Event. event - (FrameworkEvent) The original event object. bundle.id - (Long) The source's bundle id. bundle.symbolicName - (String) The source bundle's symbolic name. Only set if the bundle's symbolic name is not null. bundle.version - (Version) The version of the bundle, if set. bundle.signer - (String|Collection<String>) The DNs of the signers. bundle - (Bundle) The source bundle. exception.class - (String) The fully-qualified class name of the attached Exception. exception.message -( String) The message of the attached exception. Only set if the Exception message is not null. exception - (Throwable) The Exception returned by the getThrowable method. Unknown events must be ignored. The following event properties must be set for a Bundle Event. If listeners require synchronous delivery then they should register a Synchronous Bundle Listener with the Framework. event - (BundleEvent) The original event object. event - (ServiceEvent) The original Service Event object. service.id - (Long) The service's ID. service.pid - (String or Collection<String>) The service's persistent identity. Only set if not null. If the PID is specified as a String then it must be coerced into a Collection<String>. service.objectClass - (String) The service's object class. Several OSGi service specifications define their own event model. It is the responsibility of these services to map their events to Event Admin events. Event Admin is seen as a core service that will be present in most devices. However, if there is no Event Admin service present, applications are not mandated to buffer events. The Event Admin service must be registered as a service with the object class org.osgi.service.event.EventAdmin. Multiple Event Admin services can be registered. Publishers should publish their event on the Event Admin service with the highest value for the SERVICE_RANKING service property. This is the service selected by the getServiceReference method. The Event Admin service is responsible for tracking the registered handlers, handling event notifications and providing at least one thread for asynchronous event delivery. Synchronous event delivery is initiated by the sendEvent method. When this method is invoked, the Event Admin service determines which handlers must be notified of the event and then notifies each one in turn. The handlers can be notified in the caller's thread or in an event-delivery thread, depending on the implementation. In either case, all notifications must be completely handled before the sendEvent method returns to the caller. Synchronous event delivery is significantly more expensive than asynchronous delivery. All things considered equal, the asynchronous delivery should be preferred over the synchronous delivery. Callers of this method will need to be coded defensively and assume that synchronous event notifications could be handled in a separate thread. That entails that they must not be holding any monitors when they invoke the sendEvent method. Otherwise they significantly increase the likelihood of deadlocks because Java monitors are not reentrant from another thread by definition. Not holding monitors is good practice even when the event is dispatched in the same thread. Asynchronous event delivery is initiated by the postEvent method. When this method is invoked, the Event Admin service must determine which handlers are interested in the event. By collecting this list of handlers during the method invocation, the Event Admin service ensures that only handlers that were registered at the time the event was posted will receive the event notification. This is the same as described in Delivering Events of OSGi Core Release 7. The Event Admin service can use more than one thread to deliver events. If it does then it must guarantee that each handler receives the events in the same order as the events were posted, unless this handler allows unordered deliver, see Ordering. This ensures that handlers see events in their expected order. For example, for some handlers it would be an error to see a destroyed event before the corresponding created event. Before notifying each handler, the event delivery thread must ensure that the handler is still registered in the service registry. If it has been unregistered then the handler must not be notified. Asynchronous events are delivered in the order in which they arrive in the event queue. Thus if two events are posted by the same thread then they will be delivered in the same order (though other events may come between them). However, if two or more events are posted by different threads then the order in which they arrive in the queue (and therefore the order in which they are delivered) will depend very much on subtle timing issues. The event delivery system cannot make any guarantees in this case. An Event Handler can indicate that the ordering is not relevant, allowing the Event Admin to more aggressively parallelize the event deliver, see Ordering. Synchronous events are delivered as soon as they are sent. If two events are sent by the same thread, one after the other, then they must be guaranteed to be processed serially and in the same order. However, if two events are sent by different threads then no guarantees can be made. The events can be processed in parallel or serially, depending on whether or not the Event Admin service dispatches synchronous events in the caller's thread or in a separate thread. Note that if the actions of a handler trigger a synchronous event, then the delivery of the first event will be paused and delivery of the second event will begin. Once delivery of the second event has completed, delivery of the first event will resume. Thus some handlers may observe the second event before they observe the first one. If a handler throws an Exception during delivery of an event, it must be caught by the Event Admin service and handled in some implementation specific way. If a Log Service is available the exception should be logged. Once the exception has been caught and dealt with, the event delivery must continue with the next handlers to be notified, if any. As the Log Service can also forward events through the Event Admin service there is a potential for a loop when an event is reported to the Log Service. Event handlers should not spend too long in the handleEvent method. Doing so will prevent other handlers in the system from being notified. If a handler needs to do something that can take a while, it should do it in a different thread. An event admin implementation can attempt to detect stalled or deadlocked handlers and deal with them appropriately. Exactly how it deals with this situation is left as implementation specific. One allowed implementation is to mark the current event delivery thread as invalid and spawn a new event delivery thread. Event delivery must resume with the next handler to be notified. Implementations can choose to blacklist any handlers that they determine are misbehaving. Blacklisted handlers must not be notified of any events. If a handler is blacklisted, the event admin should log a message that explains the reason for it. Implementations of the Event Admin service can support passing events to, and/or receiving events from native applications. Implementations can support additional types. Property values of unsupported types must be silently discarded. The RequireEventAdmin annotation can be used to require this capability. This capability must follow the rules defined for the osgi.implementation Namespace. The TopicPermission class allows fine-grained control over which bundles may post events to a given topic and which bundles may receive those events. The target parameter for the permission is the topic name. TopicPermission classes uses a wildcard matching algorithm similar to the BasicPermission class, except that solidi ('/' \u002F) are used as separators instead of full stop characters. For example, a name of a/b/* implies a/b/c but not x/y/z or a/b. There are two available actions: PUBLISH and SUBSCRIBE. These control a bundle's ability to either publish or receive events, respectively. Neither one implies the other. Bundles that need to register an event handler must be granted ServicePermission[org.osgi.service.event.EventHandler, REGISTER]. In addition, handlers require TopicPermission[ <topic>, SUBSCRIBE ] for each topic they want to be notified about. Bundles that need to publish an event must be granted ServicePermission[ org.osgi.service.event.EventAdmin, GET] so that they may retrieve the Event Admin service and use it. In addition, event sources require TopicPermission[ <topic>, PUBLISH] for each topic they want to send events to. Bundles that need to iterate the handlers registered with the system must be granted ServicePermission[org.osgi.service.event.EventHandler, GET] to retrieve the event handlers from the service registry. Only a bundle that contains an Event Admin service implementation should be granted ServicePermission[ org.osgi.service.event.EventAdmin, REGISTER] to register the event channel admin service. During an event notification, the Event Admin service's Protection Domain will be on the stack above the handler's Protection Domain. In the case of a synchronous event, the event publisher's protection domain can also be on the stack. Therefore, if a handler needs to perform a secure operation using its own privileges, it must invoke the doPrivileged method to isolate its security context from that of its caller. The event delivery mechanism must not wrap event notifications in a doPrivileged call. EventAdmin - The Event Admin service. EventConstants - Defines standard names for EventHandler properties. EventHandler - Listener for Events. EventProperties - The properties for an Event. TopicPermission - A bundle's authority to publish or subscribe to event on a topic. topic The topic of the event. properties The event's properties (may be null). A property whose key is not of type String will be ignored. If the specified properties is an EventProperties object, then it will be directly used. Otherwise, a copy of the specified properties is made. Throws IllegalArgumentException– If topic is not a valid topic name. properties The event's properties (may be null). A property whose key is not of type String will be ignored. A copy of the specified properties is made. □ Indicate the presence of an event property. The event topic is present using the property name "event.topics". Returns true if a property with the specified name is in the event. This property may have a null value. false otherwise. object The Event object to be compared. □ Compares this Event object to another object. Returns true if object is a Event and is equal to this object; false otherwise. □ Retrieve the value of an event property. The event topic may be retrieved with the property name "event.topics". Returns The value of the property, or null if not found. □ Returns a list of this event's property names. The list will include the event topic property name "event.topics". Returns A non-empty array with one element per property. □ Returns the topic of this event. Returns An integer which is a hash code value for this object. filter The filter to test. □ Tests this event's properties against the given filter using a case sensitive match. Returns true If this event's properties match the filter, false otherwise. □ Returns the string representation of this event. event The event to send to all listeners which subscribe to the topic of the event. □ Initiate asynchronous, ordered delivery of an event. This method returns to the caller before delivery of the event is completed. Events are delivered in the order that they are received by this method. Throws SecurityException– If the caller does not have TopicPermission[topic,PUBLISH] for the topic specified in the event. □ Initiate synchronous delivery of an event. This method does not return to the caller until delivery of the event is completed. 113.12.4.1 public static final String BUNDLE = "bundle"
113.12.4.2 public static final String BUNDLE_ID = "bundle.id"
113.12.4.3 public static final String BUNDLE_SIGNER = "bundle.signer"
113.12.4.4 public static final String BUNDLE_SYMBOLICNAME = "bundle.symbolicName"
113.12.4.5 public static final String BUNDLE_VERSION = "bundle.version"
113.12.4.6 public static final String DELIVERY_ASYNC_ORDERED = "async.ordered"
113.12.4.7 public static final String DELIVERY_ASYNC_UNORDERED = "async.unordered"
113.12.4.8 public static final String EVENT = "event"
113.12.4.9 public static final String EVENT_ADMIN_IMPLEMENTATION = "osgi.event"
113.12.4.10 public static final String EVENT_ADMIN_SPECIFICATION_VERSION = "1.4.0"
113.12.4.11 public static final String EVENT_DELIVERY = "event.delivery"
113.12.4.12 public static final String EVENT_FILTER = "event.filter"
113.12.4.13 public static final String EVENT_TOPIC = "event.topics"
113.12.4.14 public static final String EXCEPTION = "exception"
113.12.4.15 public static final String EXCEPTION_CLASS = "exception.class"
113.12.4.16 public static final String EXCEPTION_MESSAGE = "exception.message"
113.12.4.17 public static final String EXECPTION_CLASS = "exception.class"
Deprecated As of 1.1. Replaced by EXCEPTION_CLASS. 113.12.4.18 public static final String MESSAGE = "message"
113.12.4.19 public static final String SERVICE = "service"
113.12.4.20 public static final String SERVICE_ID = "service.id"
113.12.4.21 public static final String SERVICE_OBJECTCLASS = "service.objectClass"
113.12.4.22 public static final String SERVICE_PID = "service.pid"
113.12.4.23 public static final String TIMESTAMP = "timestamp"
event The event that occurred. □ Called by the EventAdmin service to notify the listener of an event. properties The properties to use for this EventProperties object (may be null). □ Create an EventProperties from the specified properties. □ This method throws UnsupportedOperationException. □ Indicates if the specified property is present. Returns true If the property is present, false otherwise. □ Indicates if the specified value is present. Returns true If the value is present, false otherwise. □ Return the property entries. Returns A set containing the property name/value pairs. object The EventProperties object to be compared. □ Compares this EventProperties object to another object. Returns true if object is a EventProperties and is equal to this object; false otherwise. name The name of the specified property. □ Return the value of the specified property. □ Indicate if this properties is empty. Returns true If this properties is empty, false otherwise. □ Return the names of the properties. Returns The names of the properties. □ Return the number of properties. Returns The number of properties. □ Returns the string representation of this object. □ Return the properties values. Returns The values of the properties. 113.12.7.1 public static final String PUBLISH = "publish"
113.12.7.2 public static final String SUBSCRIBE = "subscribe"
□ Defines the authority to publish and/or subscribe to a topic within the EventAdmin service. obj The object to test for equality with this TopicPermission object. □ Determines the equality of two TopicPermission objects. This method checks that specified TopicPermission has the same topic name and actions as this TopicPermission object. Returns true if obj is a TopicPermission, and has the same topic name and actions as this TopicPermission object; false otherwise. □ Returns the canonical string representation of the TopicPermission actions. Returns Canonical string representation of the TopicPermission actions. p The target permission to interrogate. □ Determines if the specified permission is implied by this object. Returns true if the specified TopicPermission action is implied by this object; false otherwise. □ Returns a new PermissionCollection object suitable for storing TopicPermission objects. Returns A new PermissionCollection object. This package contains annotations that can be used to require the Event Admin implementation. RequireEventAdmin - This annotation can be used to require the Event Admin implementation. This annotation can be used to require the Event Admin implementation. It can be used directly, or as a meta-annotation. This annotation is applied to several of the Event Admin component property type annotations meaning that it does not normally need to be applied to Declarative Services components which use the Event Admin. EventDelivery - Component Property Type for the EventConstants.EVENT_DELIVERY service property of an EventHandler service. EventFilter - Component Property Type for the EventConstants.EVENT_FILTER service property of an EventHandler service. EventTopics - Component Property Type for the EventConstants.EVENT_TOPIC service property of an EventHandler service. □ Service property specifying the Event delivery qualities requested by an EventHandler service. Returns The requested event delivery qualities. This annotation can be used on an EventHandler component to declare the value of the EventConstants.EVENT_FILTER service property. □ Service property specifying the Event filter to an EventHandler service. □ Service property specifying the Event topics of interest to an EventHandler service. Added org.osgi.service.event.annotations and org.osgi.service.event.propertytypes packages.